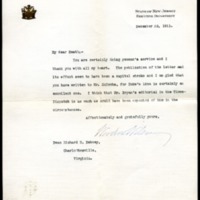 Woodrow Wilson writes to Richard Heath Dabney discussing political strategy. You are certainly doing yeoman'as service and I thank you will all my heart. The publication of the letter and its effect seem to have been a capital stroke and I am glad that you have written to Mr. McCombs, for Duke's idea is certainly an excellent one. I think that Mr. Bryan's editorial in the Times-Dispatch is as much as could have been expected of him in the circumstances. Wilson, Woodrow, 1856-1924, “Woodrow Wilson to Richard Heath Dabney,” 1911 December 22, WWP20457, University of Virginia Woodrow Wilson Letters, Woodrow Wilson Presidential Library & Museum, Staunton, Virginia.